Join Dr. Joe Kellerstein as he reviews important homeopathic remedies used during collapse. He will share from his vast clinical experience as well as cases from the classical literature. Remedies to be covered include: Opium, Arnica, Belladonna, Camphora, Veratrum album, Carbo vegetablis. *Participants in the Homeopathic First Aid Course may earn 1 Homeopathic Educational Hour with this session! Of all the work we do as homeopaths, no facet of our practice is more likely to build a loyal client base than effective Homeopathic First Aid. When a remedy stops that midnight asthma attack, or soothes the pain of a bad burn, or gets a young athlete back on his feet after a concussion, homeopathy earns one more lifelong devotee. And yet, Homeopathic First Aid is sorely neglected in most schools, taking a back seat to general therapeutics. Do you know the best remedies for dental emergencies? The first-aid indications for Cinnamonum and Gossypium? How to differentiate Belladonna, Phosphorus and Millefolium in bleeding? Dr. Joe Kellerstein is a licensed naturopath, a protegé of Andre Saine and an international homeopathic lecturer who has recently taught groundbreaking classes in the Organon and Case Taking for WholeHealthNow. Dr. Kellerstein's more than 30 years in practice have taught him the importance of a solid foundation in Homeopathic First Aid. Be prepared for a robust practice with trusting long-term clients! 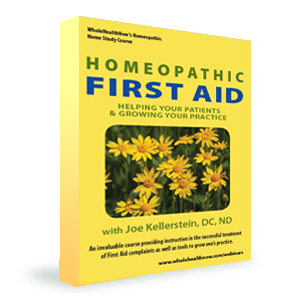 Join WholeHealthNow and Dr. Kellerstein for this invaluable series on Homeopathic First Aid. Homeopathic First Aid is another in WholeHealthNow's ongoing At-Home Learning Series, offering high-quality, affordable homeopathic education.